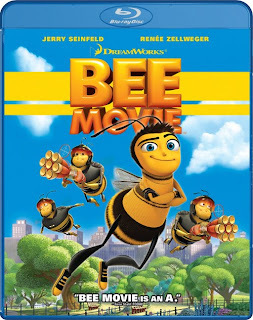 Bee Movie is a 2007 Golden Globe-nominated CGI-animated film produced by DreamWorks Animation, it is directed by Simon J. Smith and Steve Hickner. 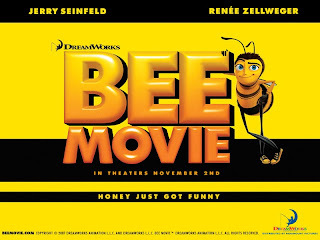 Bee Movie is the first motion-picture script to be written by Seinfeld, who co-wrote it with Spike Feresten, Barry Marder, and Andy Robin.Barry B. Benson is "just an ordinary bee" in a hive located in Sheep's Meadow in Central Park in New York City. Barry recently graduated from college and is about to enter the hive's Honex Industries (a division of Honesco Corporation and owned by Hexagon Group) honey-making workforce. Along with his best friend Adam Flayman (voiced by Matthew Broderick) Barry is initially very excited, but his latent, non-conformist attitude emerges upon finding out that his choice of job will never change once picked. This prompts Barry to leave the hive and see the world on a daily run with the macho, elite 'Pollen Jocks', though Adam tries to talk Barry out of it. He thoroughly enjoys his new freedom, and is impressed by the process of nectar collection and pollination, but after being stuck to a tennis ball during a game and flying through a panicky family's car he decides humans are crazy and that he should go home. Unfortunately, it begins to rain and he crash lands on a windowsill. The apartment's occupants have just come home and they close the window before Barry can escape. After freaking out the people inside and nearly being squashed, he is rescued by a female human named Vanessa Bloome and gently put back outside. This unexpected act of kindness intrigues Barry, who goes back in to thank the woman even though doing so would violate Bee Law #1 - "Don't talk to humans". Despite both of their expectations they develop an instant bond - bordering on attraction - and start hanging out together frequently. Of course all of their friends and family are completely upset by this relationship. While they are going through a grocery store Barry is shocked to discover that the humans have been stealing and eating the bees' honey for centuries, and after venturing to Honey Farms and witnessing the artificial process by which the honey is gathered, he ultimately realizes that his true calling in life is to set the world right by suing the human race for stealing their precious honey. This is later shown on Bee Larry King via Hive at Five. The trial initially goes well, until the main defense lawyer goads Adam into stinging him by pointing out the fact that all of the bees are siblings in order to show the less lovable side of bees, but Barry counters by producing the smoke-machine used by Honey Farms to drug and subdue their bees. Barry wins the lawsuit, and all honey in the world is confiscated and returned to the bees. Too late, Barry and Vanessa realize that the sudden, massive stockpile of honey has put every bee out of a job, including the vitally important Pollen Jocks. Without bees pollinating the flowers, all plant life begins dying with the entire food chain close behind. To set things right, he and Vanessa find a way to save all the flowers by going to the Tournament of Roses Parade in California and bringing back with them all the pollen-filled flowers to re-pollinate the world. Barry and Vanessa fly the flowers as luggage on a flight from Los Angeles International Airport to John F. Kennedy International Airport. The flight begins to take a detour which would be fatal to the flowers, and in trying to intervene Barry accidentally knocks out the terrified pilots. 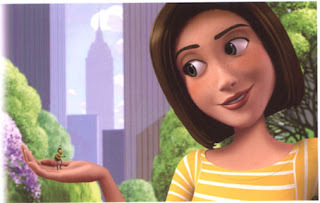 Vanessa joins him and tries unsuccessfully to fly the plane, but in the meantime millions of bees have rallied together and arrive at the last minute to help them safely land. Armed with the pollen of the last flowers, Barry and the Pollen Jocks manage to reverse the damage and save the world's flowers, also restarting the bees' beloved honey production. Nothing is mentioned about the fate of the existing honey or companies like Honey Farms, though humans and bees are seen treating each other visibly better. 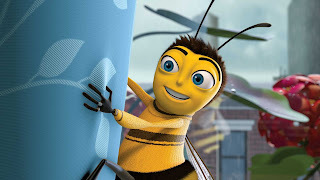 Barry becomes a member of the Pollen Jocks, helping to pollinate the plants while also running a law firm inside Vanessa's flower shop, as well as helping Vanessa, switching the name from "Vanessa's Flowers" to "Vanessa and Barry: Flowers; Honey; Legal Advice". As the film closes, his office door reads "Insects at Law." Mooseblood also works in his office with him, shown when Barry is interviewing a cow.